Background Systematic reviews reporting time trends in mortality following major orthopaedic surgery are few and have limitations. They reported on only a fraction (< 15%) of the available data and did not investigate potential causes of the reduction in mortality. Methods We searched PubMed for randomized trials and observational studies, published between 1950 and 2016, reporting on mortality within 3 months of elective total hip and knee replacement (THR/TKR). Mortality risks were estimated for each 5-year interval using a Poisson regression model and presented by study design and mode of prophylaxis. To estimate the mortality reduction unrelated to anti-thrombotic use, we performed a pooled analysis of four thromboprophylaxis strategies for which data spanned five decades. Results We identified 255 eligible studies, which documented 31,604 deaths among 6,293,954 patients, and found a consistent decline in mortality irrespective of study design and mode of prophylaxis. Mortality declined from 1.15% pre-1980 to 0.24% post-2000, a 78.7% relative risk reduction (95% confidence interval [CI]: 74.7–82.1%) in randomized and cohort studies. 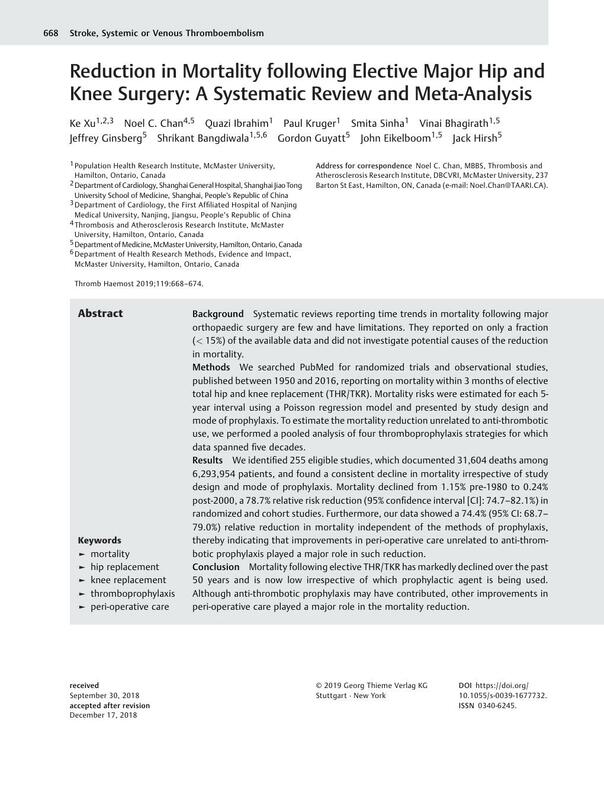 Furthermore, our data showed a 74.4% (95% CI: 68.7–79.0%) relative reduction in mortality independent of the methods of prophylaxis, thereby indicating that improvements in peri-operative care unrelated to anti-thrombotic prophylaxis played a major role in such reduction. Conclusion Mortality following elective THR/TKR has markedly declined over the past 50 years and is now low irrespective of which prophylactic agent is being used. Although anti-thrombotic prophylaxis may have contributed, other improvements in peri-operative care played a major role in the mortality reduction.